Make peace with your critical self and heal nervous habitual, obsessive, compulsive self injurious skin picking. 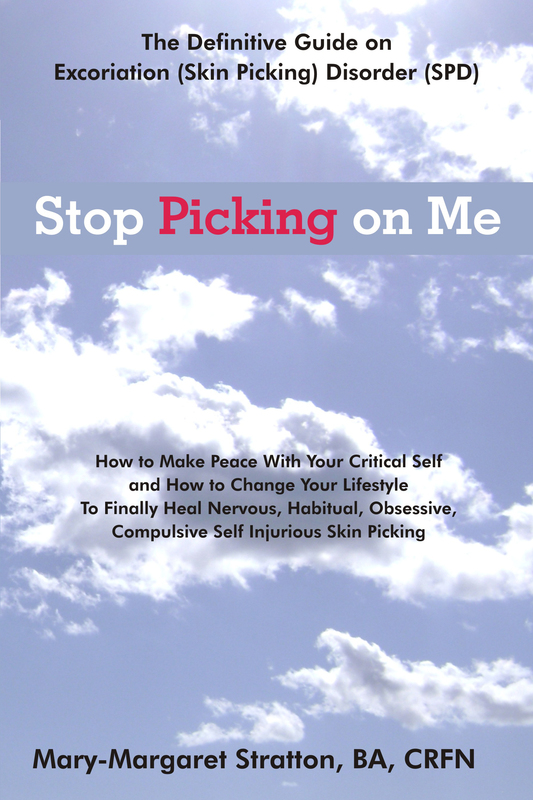 How to Make Peace with Your Critical Self & How to Change your Lifestyle To Finally Heal the Phenomenon of Nervous, Obsessive, Compulsive and Habitual Skin Picking. This is the most comprehensive life-saving book ever written on the topic. You will gain overwhelming Understanding, Answers, Courage, and Hope. Learn about what you “do” and why you do it. Then learn how to eradicate breakouts, and stop your compulsion to pick. Mary-Margaret ‘anand sahaja’ Stratton, is the Founding Mother Healer of Excoriation Disorder. She is an Essene Minister, ‘Certified Raw Food Nutritionist,’ Instructional Designer, and ‘veteran’ of Twelve Step philosophy. Long before the DSM identified the condition, anand wrote a ground-breaking book and shared it for free online, along with creating the forum, StopPickingOnYou. Now years later, she shares her approach to find radical recovery which has kept her one hundred percent pick-free through holistic means: mindful techniques, behavior modification and especially natural nutrition – a whole foods diet. She is living proof that changing your life can affect your brain chemistry, make you happier AND less likely to succumb to OCD behaviors. Revised with over 400 pages of content. *How do you stop picking? *Stop Picking at In-Grown Hairs? Do you truly want to stop, but can’t seem to quit? If so, this is the book for you. It contains the comprehensive knowledge, proven effective tools, tips and treatment strategies, including Habit Reversal and Cognitive Behavioral Therapy techniques. Dermatillomantia can be cured. And teaches you the nutrition connection that few pharmaceutical-trained doctors cover. This book hits covers physiological, philosophical and psychological methods to remove unwanted anxious obsessive compulsive impulsive thoughts and actions.